Lauralea and I went for a short, hilly run this morning — net change in elevation of 350 feet, repeated several times over 2.5 miles — and then went to Lost River State Park for a hike up Big Ridge (elevation 3200-3300 feet) on White Oak Trail. On the way, we passed groves of trees that looked almost exactly the way I imagine the edges of (nerd alert) Lothlórien looking. As the XO for our first-year composition course, I’ve been drafting the staff syllabus, which serves as something less than a template for new instructors and as something less than a guide for veteran instructors. Textbooks and due dates for the major graded assignments are shared requirements, and there are a few readings from the handbook and the rhetoric that we ask all instructors to assign, but beyond that, it’s perhaps not as regimented as one might expect at an institution like ours. Still, in drafting a staff FYC syllabus and preparing to sell it to incoming faculty, I’ve found myself needing to articulate to myself my core assumptions about the teaching of writing. They follow, and I’d welcome additions or arguments. The course starts and ends with student writing, quite literally: writing is the first thing they do upon entering the classroom for lesson 1, and the last thing they do before leaving the classroom after lesson 40. Writing is first a verb and second a noun: the activity is always foregrounded before the product. Three or four major writing projects, with time taken to engage the diverse components of the processes of writing (generative writing, developing, drafting, seeking and receiving feedback, revising, editing, proofreading, publishing, reflecting) feels about right for a semester. Five feels like too many; two like too few. In working with the classical canons, invention and organization always come prior to style and delivery, both at the project scale and at the semester scale. Ontogeny recapitulates phylogeny. The course requires both a handbook and a rhetoric. The rhetoric often best serves the earlier functions (invention and organization), while the handbook often best serves the later functions (style and delivery). This tends to set up a rhythm in assigning readings. Revision always leaves portions of writing behind. Students, like all writers, will produce writing that they do not publish. That doesn’t mean that such writing should be discarded: save it, come back to it, maybe not in this class, but later. Get students used to setting aside portions of their work. Difficulty is productive, and should be acknowledged as such. When a student says, “This challenges me and I don’t know what to do,” we should take this as a point of entry rather than a roadblock. Respond: “How? Why? At what point?” Then respond: “I’d like to hear more about that. Can you write about it?” The worst writing often comes from what is taken for granted; from what is easy. The best comes out of complexity. Don’t mark error at all on early drafts. (No: really: don’t.) On later or final drafts, don’t mark every error. For each essay, talk to students before they turn in a later draft about the two or three or four errors they want help with. Go to the handbook for those errors at the later-draft stages. One learns to write by writing. The core focus of a course on writing is writing. The direct method of instruction seems self-evident; from those who would advocate alternative methods, I would require supporting evidence. I am suspicious of any syllabus that seeks to privilege a third text — a reader — over a rhetoric and a handbook. Such privilege indicates to me both a belief that the material of a writing course is not writing, and a belief that the writing course is a proper vehicle for indoctrination. Publication is essential. Writers must have the opportunity to see readers — not just the teacher — reading and reacting to their writing. Writing has value, and the value of students’ work must be acknowledged, must be celebrated. Point blank: publication makes writing better. 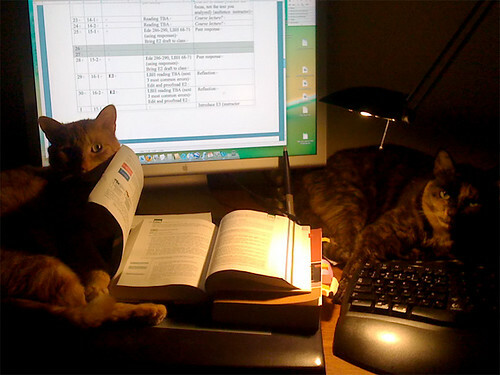 Major assignments must have links between them. A project begun in an earlier essay should lead in some way to a later essay. Students’ written reflections on their projects should foreground those links, and instructors’ written responses to student writing must acknowledge and foster those links, as well as acknowledging students’ writings as trajectories rather than as strings of individual performances. Students should self-assess, repeatedly: metacognition is essential to knowledge transfer. Ask students to write reflections about their essays on the days they turn them in. They’ll like being able to call your attention to the ways they’ve improved, and what they think is best about their essays. You’ll like the guide to grading that their reflections offer. Ask them, though, to be not only evaluative but descriptive: understanding how they write, and putting it in writing, will help them as well as you. Take their reflections seriously, and show them that you do so by engaging them and responding to them.